Link Up for a Day In My Shoes! *I also have thirty minutes of computer lab time for each class period, each week. 1st period goes on Monday, 2nd period goes on Tuesday and so on. 2nd period has library on Mondays too, so we lose thirty minutes of class time. I would be so confused if different kids kept showing up. I think I would forget what I was supposed to teach to whom! That's one of the reasons I have always resisted the move to middle school. I tutor (voluntarily) too--I'm really hoping it will help some of my strugglers. I feel deja vu daily! I use an agenda for each class so that I make sure to teach and do everything I planned. I have volunteered my time to tutor the last two years and I have really noticed a difference in students. Thank you for stopping by! Im loving reading about everyone's day! You get up so early! I am so jealous as I read some blogs with nine 0'clock start times. I wish we would have a later start to the day. We have some students that attend both before school and after school tutoring. So they are at school for up to nine and half hours. Yeah for another middle school teacher! I so wish that I just taught reading and spelling. I am not a big fan of the writing part! I use to teach reading, spelling, writing, and English. This is my first year of only teaching reading and spelling and I love it! Thank you for stopping by. I just came across your blog and am your newest follower! 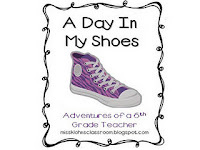 I loved readng about a day in your shoes! Thank you for being a new follower! Your blog is awesome and I am your 667 follower!